Hard water deposits, rough skin, dry hair, limescale build-up – these are just some of the things you will have to deal with if your home has hard water. Having hard water at home means it contains a lot of minerals. You can tell that you have hard water at home if you can spot build up around your faucet or other water fixtures. Soap scum also tends to form. If you have dry and itchy skin, especially right after taking a bath. Hard water also leaves spots on your dishes, sink and glasses. You can’t change the kind of water that comes into your home, but you can change your home’s plumbing system, so that hard water becomes softer. That can be done with the help of a water softener. Today, you will find out which water softeners are ideal for your home and which of the ones sold today can be relied on for a long time. What Are the Different Types of Water Softeners Out There? First, why is there a need to deal with hard water? Hard water actually has a negative impact not just to your health but also to your home. First, hard water typically contains a high level of magnesium and calcium. When ingested, these hard minerals can end up causing health issues and organ problems. It may even contribute to problems such as high blood pressure and heart disease. It is also bad for the skin and hair. If you suffer from eczema, you could be susceptible to flare-ups when exposed to hard water. It is also not uncommon to experience bumpiness and patchiness of skin due to hard water. It also makes it more difficult to lather skin and shampoo. It takes a toll on your home as well. The accumulation of hard water deposits can lead to clogging of pipes and appliances. Your appliances may also have reduced efficiency when there are hard water deposits inside it. All those white spots that hard water can leave on the surfaces of your sink, appliances, tubs and showers can be unsightly. It also makes it more difficult to keep your home clean. You can solve all these issues if you install water softeners. You have two basic options when it comes to water softeners. The first one is the salt-free water softeners. A lot of homeowners prefer this kind of water softener as it is devoid of the use of chemicals, salt and potassium. The good thing about this is that it preserves the natural minerals that are in your water without all that hard water effect. The downside is that it may not be powerful enough to work in softening extremely hard water. Another option is the Ion Exchange Softener. It makes use of potassium or sodium ions and exchanges the hard water ions that are in your water. Using this type of water softener can be good for your appliances such as dishwashers and washing machines. However, you can’t drink your water if you use this kind of softener at home. Reverse Osmosis Softeners are some of the best water softeners today. These softeners make use of pressure systems in order to get rid of the impurities in the water. It can remove up to 98% of the impurities found in water. Prevent limescale from building up in your home’s pipes and making your skin feel rough. This is a tank type, demand-initiated water softener that has 48000 grains of hardness. That means it will take a long time before it begins the regenerating process again. This unit also allows users to customize their water hardness and water needs to suit their personal needs. Its 130L of square brine tank can hold a lot of salt. Regeneration usually takes up to 2 hours. It also comes with a valve head that allows for easier and more precise operation. Everything you need is in this product already. It includes a brine tank for the salt, mineral tank, a valve with an LCD screen, bypass as well as an adapter. The digital meter control valve is easy to use and work with. There is no external turbine meter as it is already included in the system. That means you can save up more space by choosing this water softener. It comes with good customer service. Has 48,000 grains of hardness, which means it will take some time before it needs regeneration. Regeneration only takes 2 hours. It truly works in getting rid of hard water from your water source. The connections are easy to install. It doesn’t require a lot of time for installation. The valve head is easy to understand. All the information there are quite easy to read. There are no parts that would seem confusing. This is a descaler and water conditioner, but it also works well as a water softener. What makes this different from all other water softeners is that it doesn’t require the use of salt and other chemicals. It is an energy-saver and it works in areas of your home that has a high level of mineral content in water. It has 10-19 grains for removing hard minerals. It effectively works in descaling your entire home’s water system. It is better for you and your home’s fixtures as it does not exchange the hard minerals such as magnesium and calcium with sodium, which is what normal water softeners do. It is good for people on a reduced salt diet. This is an effective descaling unit. It descales your entire plumbing system. It reduces the costs of operation and maintenance. You don’t need to worry that your appliances will break down easily, so even if you don’t maintain these appliances a lot you can still use them for a long time. It doesn’t require any modification in your home’s plumbing system. It will work no matter what type of pipes you are using in your home. You can easily clean your shower heads and faucets as well because the water deposits can be wiped off with ease. This water softener doesn’t require recharging or maintenance. This is a whole-house water softener system that is not as costly as others. Not ideal for homes with extremely hard water supply. Here is another descaler that works in softening water as well. It is eco-friendly as it doesn’t add sodium or salt to your water. You can see great improvements when it comes to how soft your skin and hair becomes. It can descale your entire water system at home. It makes use of complex electromagnetic waves that create the effect of soft water but without injecting salt into your water source. It is a salt-free solution to your hard water problems. You can use it in different types of water pipes except for iron and lead materials. It works as a wonderful descaler as well. You can get a 12-month guarantee and a lifetime replacement or repair guarantee with this. It delivers soft water to the entire house. Compared to other water softeners, this is not as expensive. Some said they did not feel a difference in the condition of their water. Say goodbye to dry and dull skin as well as frizzy hair with the help of this water softener. It has a chemical-free functionality that ensures calcium and magnesium in water can be turned into smaller crystals that prevent them from sticking to your plumbing surfaces. 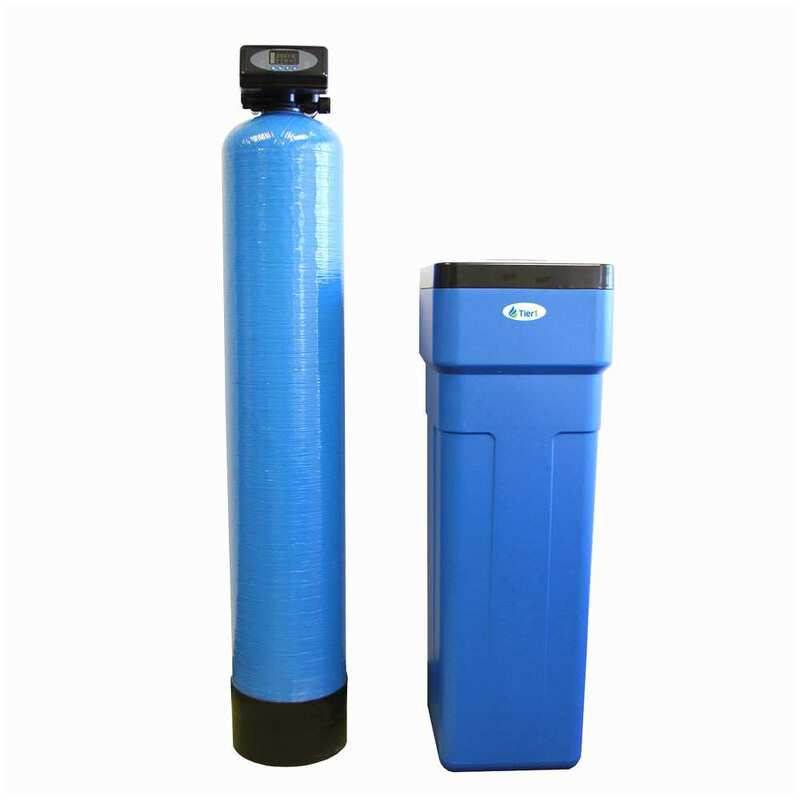 This water softener has a brushed anodized aluminum finish for more durability and has an easy self-adhesive installation method. It uses very little energy only with its 120 Volts and 2 Amperage power. It effectively removes 99% of limescale. You don’t need to keep on replacing filters and cartridges. It is easy to maintain. No special tools are needed to install it. It can effectively reduce your heating costs, especially in the winter. Many people said they like how their water doesn’t taste salty anymore. No need to carry heavy bags of pellets. Great for Big Water Needs: Tier1 High Efficiency Digital Water Softener. If you have a big family and you need a reliable water softener that can supply soft water in all plumbing fixtures in your home, this is a good choice. It has a high level of grain of hardness, so it won’t require frequent recharging. Good for Small to Medium Hard Water Problems. : iSpring ED2000 WholeHouse Electronic Descaler Water Condition and Alternative Water Softener. This is an ideal choice if you have a small household and your hard water issues are not extreme. It works as a descaler as well, so you can solve limescale deposit issues without using chemicals. Makes Your House Easier to Maintain: Eddy Electronic Water Descaler and Alternative Water Softener. While this doesn’t do anything to remove hard water from your water sources, it does help break down the minerals into smaller particles, so they are unlikely to cling to surfaces. That will then make it easier for you to keep your home clean. One of the Best: Yarna Electronic Water Softener & Descaler. There is a reason why this product didn’t receive a lot of negative reviews. It’s because it does what it sets out to do. It is one of the most effective ones out there without being too difficult to maintain. Size. Considering the size of the water softener is crucial to your home. The size should be just right for your home’s water needs. It should accommodate the specific demands of your household. If there are more of you using water at home, you would want to buy a water softener that can accommodate that size as well. Features and Functions. Is there something controlling the regeneration cycle? With each cycle, how long does it usually take? If it makes use of salt, how much is needed before it can be recharged? Even if you are getting an automatic one, there are those that still require manually salt refilling. There are those that come with timer controls. You can pre-set the time and base this on your average consumption of water. Go for the DIR controlled water softeners or the Demand-Initiated Regeneration ones as they make use of a sensor to determine when there is a need to recharge. Energy Efficiency. Since you will run the water softener all day, it is important that it doesn’t consume a lot of energy. Some do not use electricity at all but if you are using those descaler and water softeners that are electronic, make sure it operates on a low voltage. Space-Saving Design. Look for a system that will not take up a large space in your home. If you have a small space to begin with, you should look for one that will not be cumbersome to install in your home. Efficacy. Of course, you also have to think about how effective that water softener in softening your water. Some might work only on minor hard water issues while others are more capable of working with extremely hard water conditions. Choose the latter if you have more severe hard water problem in your home. Choose the former if you have minimal issues but still want to make a difference to the quality of the water you are getting. Make sure you equip your home with the best tools, equipment and systems. Keep on checking this website for more product reviews and buying guides.